Alongside the trailer, the (stunning!) 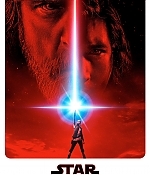 poster for Star Wars: The Last Jedi was also released. You can find it in our gallery. Also, Rian Johnson shared during the Star Wars Convention panel some behind the scenes pictures from The Last Jedi, and we have the ones including Oscar in the tweets below. We hope to get them in better quality anytime soon.